Both Atahualpa and Montezuma were updated and are available at wordpress.org. You can update from within your WordPress admin area. Added option to the (Limited PHP Code) function ‘bfa_loop’ to allow you to specify the number of times to run the loop. 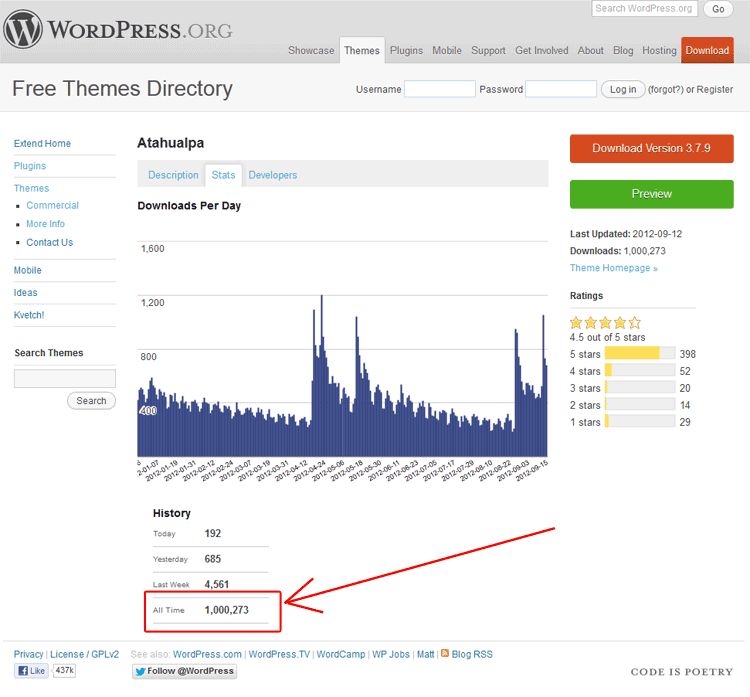 It is ignored if it exceeds the value defined in WordPress Reading Settings ‘Blog pages show at most NN posts’. Unclosed <div>… in header.php causing W3C error if default widgets were displayed (if no custom widgets in sidebar). Please discuss both Montezuma and Atahualpa at the BytesForAll WordPress Forums. Please discuss Atahualpa at the BytesForAll WordPress Forums. 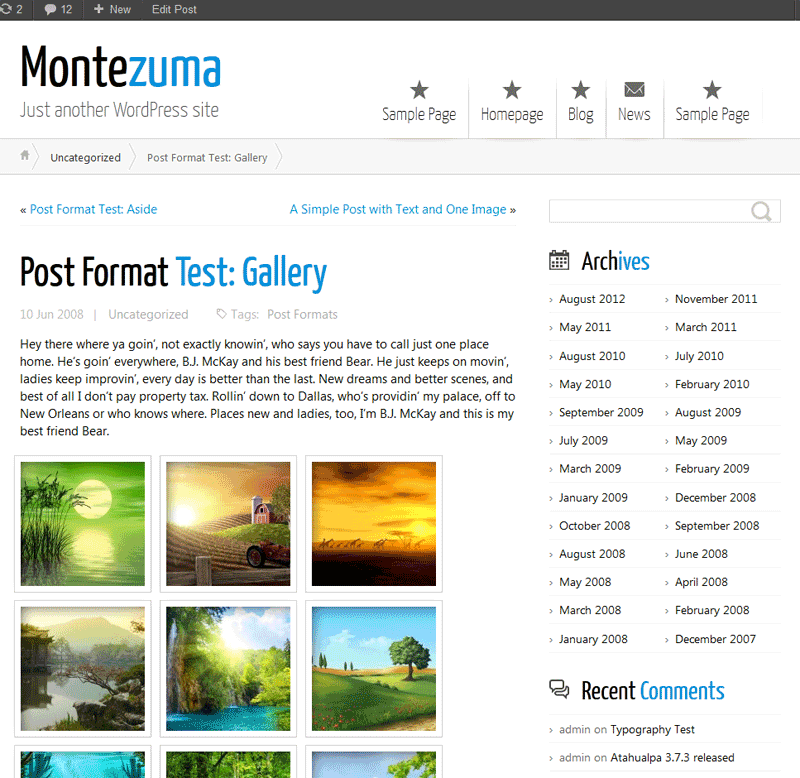 Montezuma 1.1.9 is available through the link below, and should also be available at http://wordpress.org/extend/themes/montezuma within a few days. 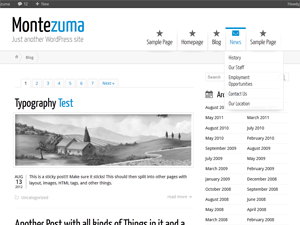 Montezuma should be listed at wordpress.org within 1-3 days. You can also download through the link listed at the bottom. added an option to change the default directory header images are stored in. You can now have separate header image folders for multisites. Atahualpa 3.7.10 is released and available at wordpress.org. Thank you very much, dear Atahualpa users. Thank you, donors. Without the donations I wouldn’t have been able to put that much effort into Atahualpa. Thank you, Paul and Larry, for helping me on the forum over at forum.bytesforall.com. Thanks also to all the people who wrote nice things about Atahualpa on their sites, and to the translators that provided language packs. And thanks to those who answered questions on the BytesForAll forum, the WordPress forum, or elsewhere. Here are some more numbers: According to Yahoo Atahualpa is used on over 5 million pages (not sites). Google lists 15.000 sites or pages for “link:wordpress.bytesforall.com”, that’s more than it shows for “link:wordpress.org”! (Google returns only a fraction of actual sites for a “link:” query). Atahualpa is being maintained since 2007 and will keep being updated and improved. It will get the long overdue technique for saving assets into the WP uploads folder and many other things, one by one. The preview seems to be not working, see http://test.bytesforall.com/ for a preview that is more full-featured anyway, until I have a fixed version up. Note: The fact that the preview doesn’t display on wordpress.org does not necessarily mean the theme is broken, not at all. Being a brand new theme there might and probably will be issues. The theme is tested though. Note: This is not the old Montezuma from 2007, I am just using the name.